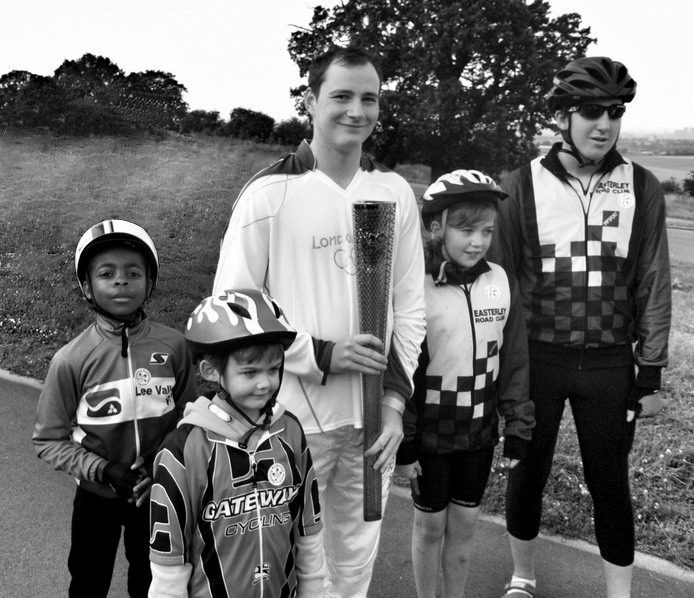 Caelan was one of the many that applied to be at Redbridge Cycling Centre for a two wheeled parade with the Olympic Torch. Applications were made via e-mail as it was a closed of affair before the Torch made its way to the many waiting at the local High Street. Most of his team mates were in attendance so a photo call opportunity was taken. He was also fortunate to be taken to the Olympics by East London Velo due to tickets given out by British Cycling to cycling clubs for various events where he watched an England womens hockey match. Pictured at the Olympic Park with Anthony Harvey of ELV.